On a sunny Saturday afternoon, I, along with Eric, Ferdz, Oggie, Dong and Omar found ourselves inside La Cocina de Tita Moning. We were there upon Ivan Man Dy’s invitation to get a taste of his relaunched Palace, Power and a shot of beer walking tour of the Malacañang Palace. The relaunched tour takes us inside the Palace grounds and inside the newly restored rooms of the Malacañang Palace Museum. 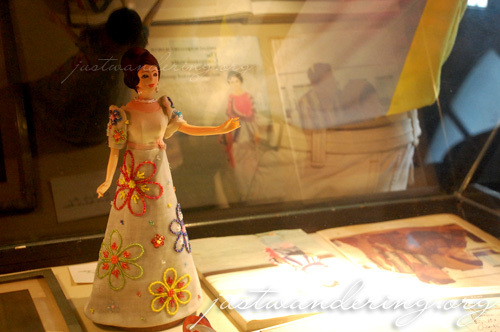 It was largely a tour of the museum, unlike the previous tour that takes you all around the San Miguel district. It was just a five-minute walk from the Legarda mansion to the Palace gates, where we were informed that Madame was inside — President Gloria Macapagal-Arroyo. There was a wave of excitement in the group. There wasn’t any certainty that we’d see her, but the knowledge that the president was in the premises was enough to get us anticipating what’s to come. Security was obviously strict. There wasn’t any frisking involved, but our bags had to go through the x-ray machine, and our cameras tagged with a PSG sticker, to indicate that we’re allowed to take photos. Ivan has toured San Miguel and the Palace grounds several times through the years that he’s now a familiar face among the security and palace staff. One of the president’s aides saw Ivan and our group approaching the entrance of the Kalayaan Hall, and motioned for us to wait at the entryway, as the president will be passing through in a couple of minutes. Within minutes, she was standing in front of us, making small talk. She was on her way to another hall, where she’s going to practice her State of the Nation Address, which she will give this afternoon (July 27) at the Batasan Hall. When the door to the hall where she will practice has closed, we all looked at each other and started talking at once. Like her or not, it’s not everyday that you get to meet the head of state. Unfortunately, we don’t have any photo of this momentous event — according to protocol, we must ask the president if it’s okay to take a photo with her. If she says yes, that’s the only time you can snap away. When you’re in a place where you’re surrounded by the Presidential Security Guards, you behave. When we’ve finally settled down, Ivan ushered us inside the museum to start the tour. 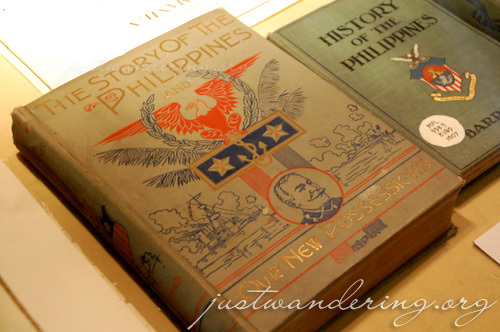 It was a trip down the Philippines’ history, leading up to the history of the Malacañan Palace. Ivan shared stories of the palace’s original owner and its succeeding occupants. It was a great refresher history course for us Filipinos, and an entertaining way to learn about the Philippine history for foreign visitors. After a tour of the museum, we went out of the palace grounds towards Plaza Aviles, where Ivan told us about the presidential palace’s famous next door neighbor: the original site of the San Miguel Brewery, where the San Miguel Beer was born. We walked back to La Cocina de Tita Moning (Legarda Mansion) for a fine-dine merienda. 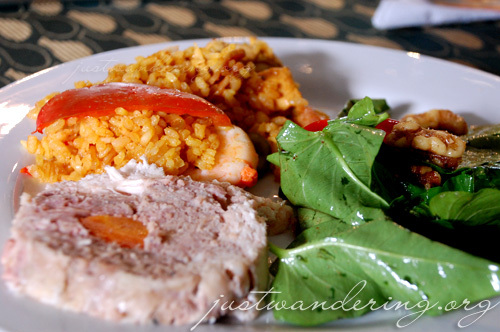 We had our fill of their specialties: paella, chicken galantina, kangkong salad with their homemade vinaigrette and the best bread pudding I’ve ever had. We washed it down with ice cold water, fresh tanglad (lemongrass) tea and yes, a shot of San Miguel Beer. While we thoroughly enjoyed our merienda, the tour wasn’t over yet. 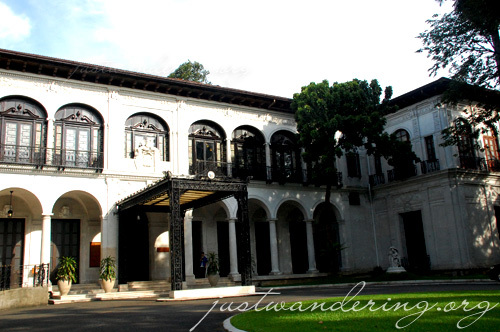 The last stop was the Legarda Mansion itself. The 1930’s building was home to one of the prominent families during the time, and it was filled with the family’s own memorabilia from years past. There were shelves filled with books from various eras and countries, several kinds of radio transmitters, old school cameras and lenses, and even a full skeleton from the patriarch’s clinic. One area of the second storey was converted into a dining area, where you can enjoy the finest home-grown recipes of the family in the most elegant setting with the family’s antique china and polished silverware. The tour officially ended there, but we stayed behind at the mansion’s living room, exchanging travel stories and making travel plans. Definitely a Saturday well spent. 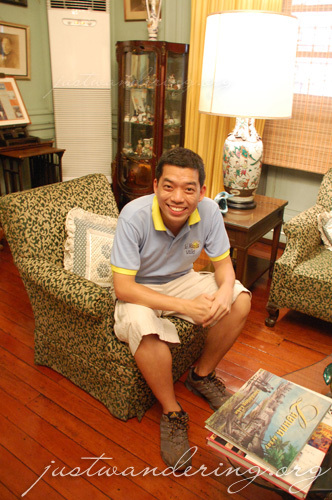 Ivan Man Dy is the man behind Old Manila Walks, a tour guide service that aims to have you experience the best of historic Manila – one step at a time. Aside from touring the presidential palace, Old Manila Walks also offer tours of Intramuros, the Chinese Cemetery, Far Eastern University, and the wildly popular Big Binondo Food Wok. The Power, Palace and a SHOT of Beer! tour costs P950.00/head (inclusive of tour and fine dine merienda), and takes about 3.5 hours. The next tour is scheduled on August 25, 2009. For more information about the Old Manila Walks tours and schedules, visit oldmanilawalks.com. How exciting! Someone actually recommended that I join in one of this walks, but it looks like they are not going to be doing anything on the only day I am in Manila. What a shame. Reading through all your posts and looking at the pictures makes me so excited about my trip already! nice to finally met you niña, i did enjoy the trip and the history. thanks also for the beer ‘coz i got two shots lol. Went on this tour a couple of years ago and I really enjoyed it. 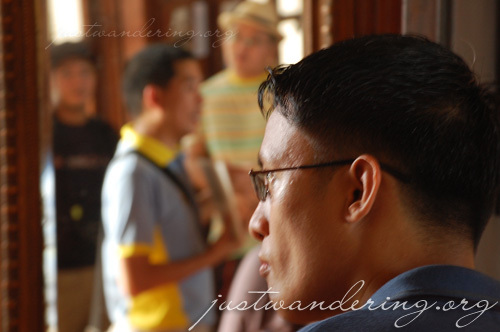 I love Old Manila Walks! Ivan’s an awesome guide and the food at La Cocina de Tita Moning is the stuff dreams are made of! we really had a great time and so nice to have met you there again. sa susunod sa byahe na. When are the dates for the Malacanang Palace tour? 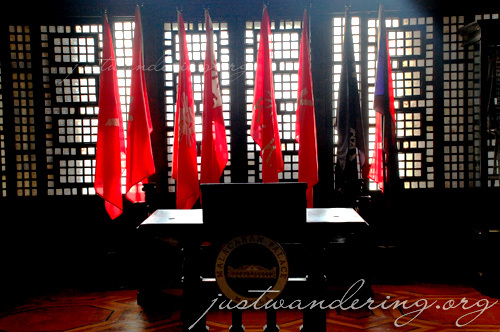 What are the schedules for your Malacanang palace tours? gud pm po we are from fly high educational tours we just want to ask whom shall we contact in order for us to have an occular visit at the malacanang Museum tnx! My wife and I will be in Manila from 10/17/10 to 11/6/10. 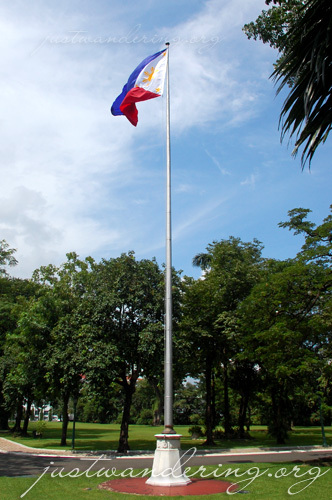 Any chances of being able to join a tour that includes Malacanan Palace? panu ba gagawin para makapagtour sa loob ng malacanang, para Nat’l museum lang ba as ease pupunta lang? Good day! I desire to have a educational tour Malacanang Palace with my out-of-school-youth/ adults students from Alternative Learning System. To educate and to strengthen the patriotism of my learners. How can we visit Malacanang?is there any entrance fee?or whatsoever? I’ll be waiting for the reply as early as possible. Thanks. I merely joined a tour of the Malacanan Palace; I do not organize them nor do I have any connections within the palace. Your best bet is to contact the palace directly.